Once upon a time I wanted to chronicle my journey fighting acne. I thought it would be great to share my experience with fellow acne sufferers. That was aeons ago. I kept putting it off. At the time I didn’t think my writing was good enough, I still don’t think my writing is good enough but as long as I can get the message across I don’t care that much anymore. I have accumulated a lot of used products that I stashed for later in the region of storage where the sun don’t shine, and forgotten - in my closet - and had been there gathering dust, and so some of them don’t look presentable anymore. 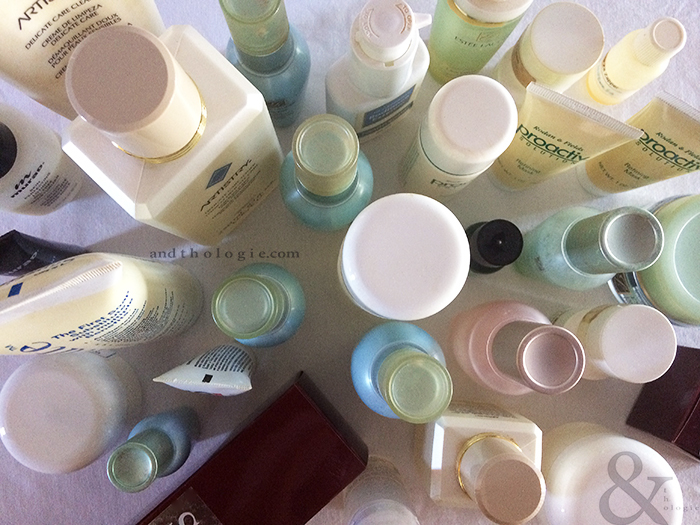 But then came this problem that I’m not an acne sufferer anymore, so the collection became even more forgotten. I do still get some spots sometimes, but less often and even so just little ones compared to the daily acne I used to get in sizeable portions. To give you an idea of how severe my acne problem was: I used to get one to three acne spots every day and this went on for many years. They were usually those red bumps, those hidden waiting-to-surface bumps and sometimes those benign-but-there white spots. You can’t simply cover them up with concealers or foundations - the bumps are still noticeable; and then you’re simply in a dilemma whether to use more makeup to cover, or less [and less often] since you need to let your skin heal. 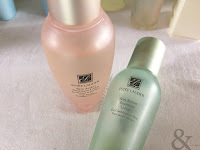 - never aggravate skin or impede cell renewal with makeup etc. I used just one product as a base on my skin, either a foundation, powder or BB cream, and washed them as soon as possible. 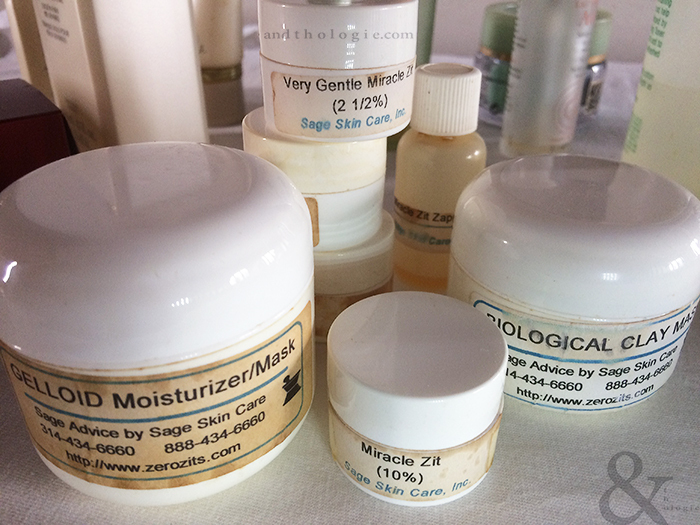 - to use a specific treatment for acne; a regular skincare alone won’t be much help. 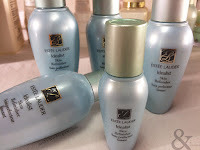 - to exfoliate skin so that newer cells are revealed and damaged cells exfoliated. - to have ‘treatment’ from inside such as supplements or food that promote cell renewal or have healing properties. I used to drink prune juice and carrot juice; and take vitamin C, fish oil, collagen, and recently Coenzyme Q10. For supplements, I don’t take them all at once, I stick to one or two supplements at one time. If I can pick two products that have helped me keep my acne under control they would be Rodan & Fields Proactiv Solution and Sage Skin Care. 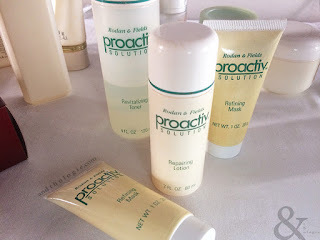 I think it was the Proactiv Solution set that I tried first and bought it twice, with Sage Skin Care in between; and Proactiv being the last ‘acne skincare‘ I used. To me, Sage Skin Care was a very interesting choice, it shows how desperate I was at the time. The products were made in the US. If you can see from the empty bottles they look like they are straight from a dermatologist’s office. But I didn’t know the doctor, all I had was a website and a bunch of people on a few skincare forums. The set was too expensive to my liking but I had to try it. At the time my acne was already diminishing and I was getting less and less spots and Sage Skin Care helped maintain that without irritating my skin. 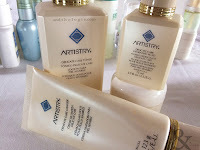 After I finished the whole set, I changed back to Proactiv, but on the whole I have a fond memory of Sage Skin Care and it shows in that I finished every bit of the product. To be honest, I don’t remember much about my experience with Proactiv other than the set worked to an extent. 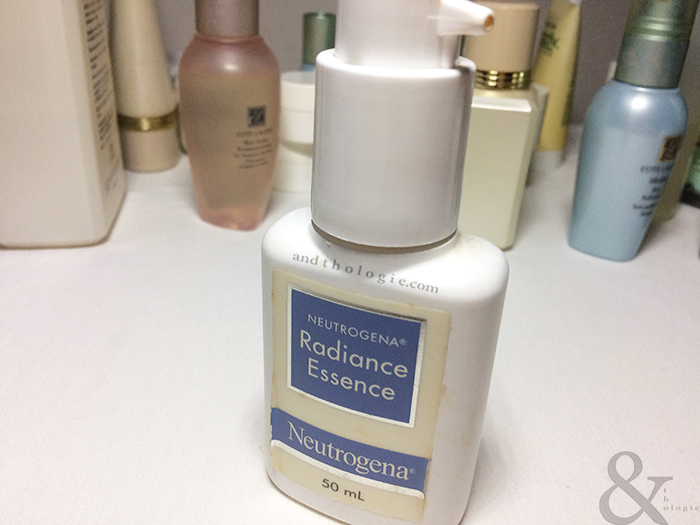 It kept my acne to a minimal, but the only thing I didn’t like about it was that it made my skin a bit raw and [even more] prone to redness which my skin already was. 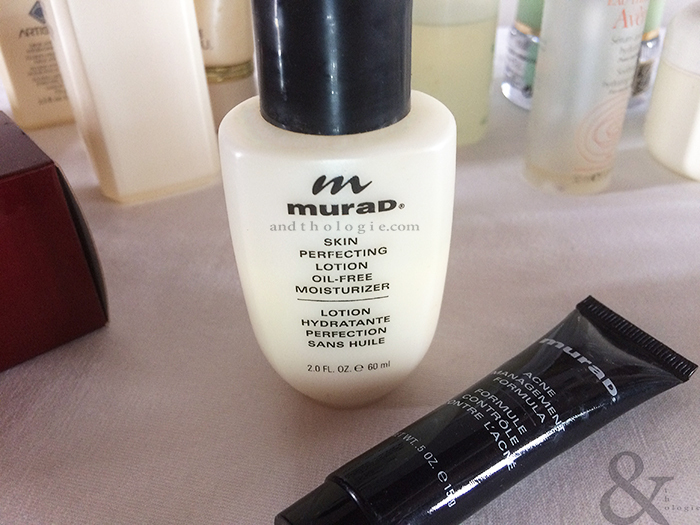 Also, the cleanser - the bottle is not in the photo - if I remember correctly was like a scrub, which had little beads in it. My facial skin does not particularly react badly to scrubs like that but the skin on my hands are quite thin so I tend to keep away from scrubs in general. The purchase that I regret the most is SKII Facial Treatment Essence. The product was supposed to help reveal new skin, which in a way I thought might be similar to a mild exfoliation but I found that it seemed to be doing nothing of the sort. I used about a quarter of the bottle and gave the rest to my sister who, I think, shares my view considering the large amount of product left unused. 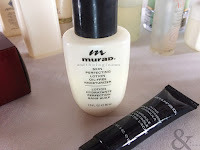 I was surprised by the performance of Murad Acne Skincare the most. I thought it would be at least on par or outperform Proactiv Solution or Sage Skin Care because of the price range alone. In the photo the cleanser is missing because I have used it up and I don’t know why but threw away the bottle, but it’s the only product in the the set that I liked. If you can see from the photo I didn’t even finish the moisturiser. 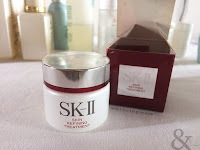 SKII Skin Refining Treatment as I remember it worked better than the Facial Treatment Essence. It didn’t irritate my skin. 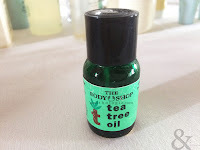 But if I were to compare it with something in my ‘collection’, it would be a little bit like The Body Shop Tea Tree Oil, not in scent or texture but in its effect on my acne; it was something similar in my opinion. I have good memories of Estee Lauder Idealist Skin Refinisher. If you can see from the photo they are the older versions of the product. I absolutely love the scent, the texture and the effect it had on my skin. 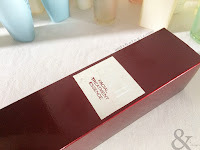 The scent was a pleasant citrus smell; the texture was like a lotion, it did not feel heavy on my skin and not greasy; it had the effect of mild exfoliation - I would put it on at night and woke up with skin flakes around the nose. I haven’t tried the new version but if it works like the older one or better then I would love it. I first tried Idealist when my skin was about to clear up but occasional acne made extra help necessary. I remember Amway Artistry Delicate Care set very much. It was agreeable to my skin. The cleanser wasn’t harsh; the moisturiser was hydrating, mild and if I remember correctly was a bit watery, which I like; the toner, I still have a lot left in the bottle, not because it irritated my skin but I just don’t believe that toners can do anything much. 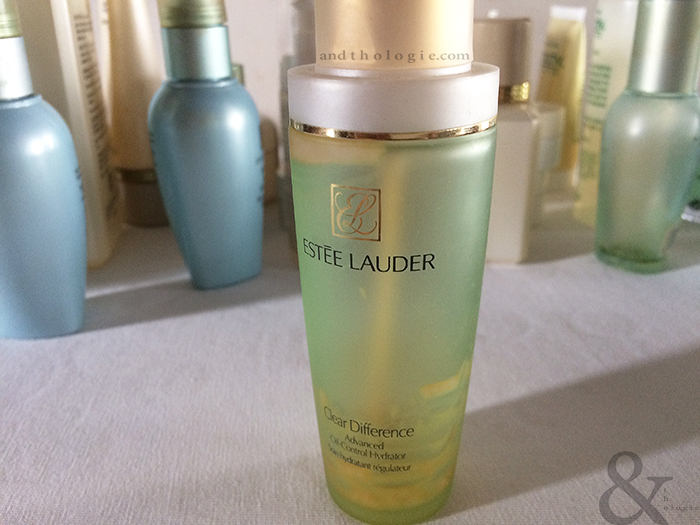 If it’s to get rid of any residues left by my cleanser then I think I need to change my cleanser, and besides I didn’t feel any difference using the set with or without the toner. Estée Lauder Clear Difference Advanced Oil-Control Hydrator was my effort to control my overactive oil production. If it had been a different kind of oil I would have been rich by now. Anyway, I finished the hydrator, I liked the texture and it wasn’t greasy upon application and did not react badly to my skin but I didn’t find it ‘controlling’ enough to purchase another bottle. 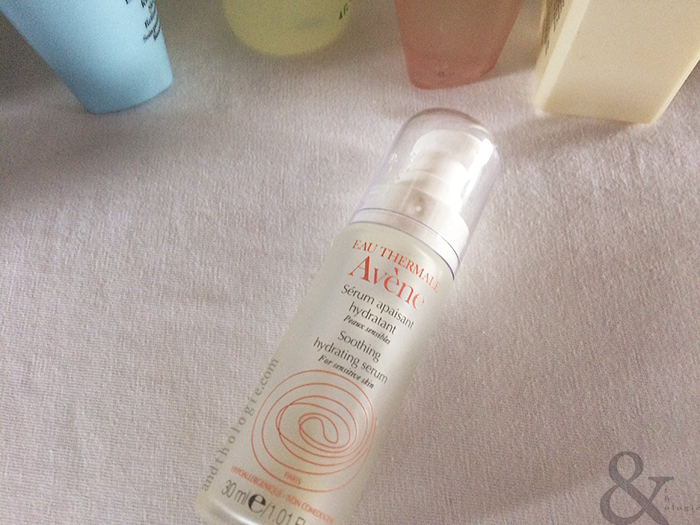 Avène Soothing Hydrating Serum is the last of facial moisturising skincare I used; I have since moved on to an ‘all-over’ moisturiser that I apply on my face. In general everything about the Oil-Control Hydrator above applies here, except maybe the oil-controlling part. The thing I have with [facial] moisturisers is that, I do believe in hydration as your skin will become even more oily to compensate for the dryness after washing which usually strips off natural oil from your skin. But I don’t like the stickiness which moisturisers leave my skin after a few hours. That, and since moisturisers for the face are generally more expensive, I have decided to move on to an all-around or a gentle body moisturiser as mentioned above. That way I can simply pat some on my face while using them on my hands. I don’t remember much of the rest of the skincare. 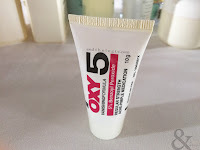 But I remember that Oxy 5 Vanishing Formula helped to accelerate the whole acne cycle. If you have that ‘hidden’ acne, it will help it come out and show itself, and if you have that white spot it will dry it out quickly. I used Oxy to spot-treat only and did not spread the lotion all over my face. I remember using Oxy 10 at one point but don’t have the empty tube here. The 10 is a stronger version and helped clear my acne faster but was also the most drying. The Body Shop Tea Tree Oil I remember as the [very] mild version of Oxy 5 in that it clears your acne eventually. It worked rather slow and I think is best for milder acne. 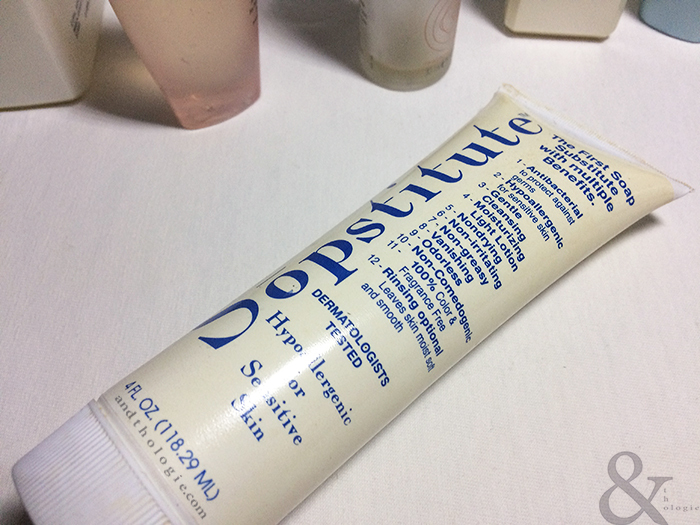 I don’t remember much of Sopstitute except that it was a sign of my desperation and it made my skin very greasy and did not do much in terms of clearing up the skin. 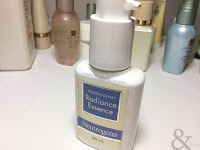 I don’t remember Neutrogena Radiance Essence the most, but judging from the large amount of product left in the bottle I think it didn’t help in any way or I was not comfortable in some way with the product. I think I got the Estée Lauder Skin Action Treatment Lotion - both the Combination Skin version and the Normal to Dry Skin version - free with purchase. As mentioned above, I don’t believe in toners which is what these two are. I finished the Combination Skin lotion but didn’t find it effective enough to buy or keep using. I didn’t finish the one in pink, which is for normal to dry skin. Anyway, your experience with any of these products might be different. I have stayed relatively clear for many years. What those acne years have taught me is that there isn’t any one thing you can do to clear up your skin permanently, but a combination of things, as mentioned above, done diligently and consistently.